The photo at the top was taken from the summit of Agio Pnevma (2262 m). Looking towards the North you can see the summit of Spathi (2048 m) and behind the city of Chania. 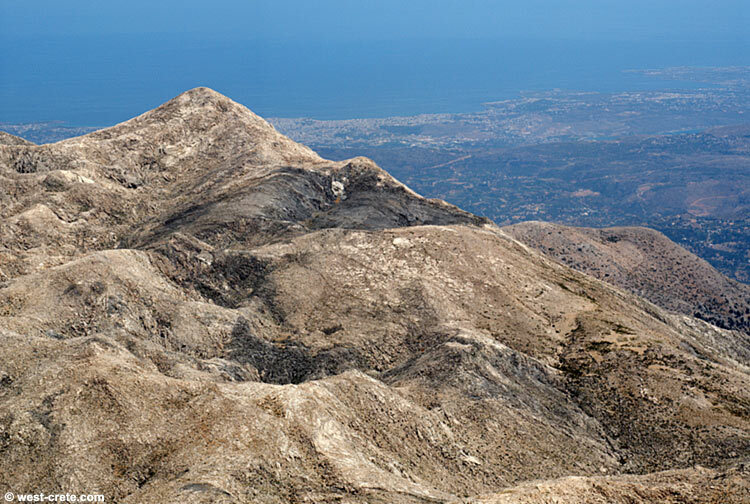 Below is a panoramic (about 150° I guess) view from the summit of Agio Pnevma (click on the image to open a large version). The centre of the image looks north. . From left to right you can see the summits of Melindaou then Ornio (with the summit of Mavri appearing above the ridge) and Spathi (centre). At the far right on the image is the eastern shoulder of Agio Pnevma. You can see Chania and Apokoronas in the background.